Josh accusing Melissa of drinking. Melissa telling Pam and Cody that she didn't. Madge, Harold and Sky walk in to find Joe tidying up. Joe tells him it's amazing the stuff you find whilst cleaning. Sky shows Joe the picture of the elephant she has painted. Harold points out that he is looking at it the wrong way. Toby comes in and asks Joe if he can have a new fishing reel; his other one is broke. Joe tells him that money is tight because of the court case. Madge and Harold tell him that he only has to ask. Joe tells them that it's not quite come to that just yet. Toby looks longingly at the picture of the fishing reel. Doug is having a chat to Cody about Melissa. Cody tells him that because Melissa has got into the wrong crowd doesn't mean that she will too. Cody tells him the last time she tried alcohol was enough to put her off, and she is surprised that Melissa does because of her epilepsy. Doug says he might have to tell Melissa's parents but Cody begs him not too. Cody promises that she will have a chat to her. Madge and Harold are watching TV when there is a knock at the door; Madge says it will be Gemma. Harold answers the door. It's a lady called Libby Markham; she is looking for Kerry! She tells Harold that she is a friend of Kerry's and they travelled together. 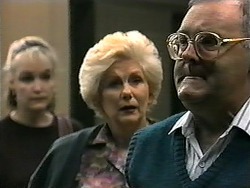 Harold becomes distressed whilst Madge invites her in. Madge tells Harold to talk to her. Gemma is studying when Matt walks in. Gemma tells him she has had problems studying due to various interruptions. Whilst she is talking there is loud music coming from the other room. Matt tells her that she is just stressed and needs to get a good nights sleep. Gemma says she has more studying to do and says she will see him in the morning. 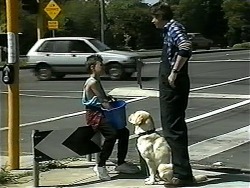 Toby is walking up the street with Bouncer; he is suggesting renting him out for dog food commercials. They met Harold in the street who is just heading off to work. Toby asks Harold if he remembers the time he gave Toby a dollar for doing odd jobs around the house. 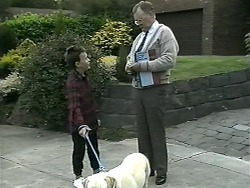 Harold asks Toby if this is about the fishing reel he is after! Harold is impressed at Toby's enterprising so tells him to come round after dinner and he will give him two dollars if he washes his car. Harold also suggests he washes the neighbour's cars too. Toby says he will think about it. Matt wakes up and can't seem to find Gemma. He goes outside to find her sleeping in the car. Gemma tells him it was to noisy inside so she came outside to study and fell asleep. Gemma looks at her watch and realises she is going to be late for her exam. Matt goes to get changed so he can take her. Melissa has come to meet Cody for school. Doug asks her if she is feeling better this morning. Melissa tells him that she is fine. Cody comes through and asks the same question and gets the same response. Melissa tells them again that she wasn't at Justin's party and she hadn't been drinking! Cody tells her that she hasn't been herself though. Melissa says that she hasn't been sleeping properly so maybe its just that, Cody says it has to be more that just that, but Melissa insists she hasn't been doing anything. Gemma tells Matt they may just make it. Matt knows a short cut. Matt runs a stop sign in full view of a police motorcycle. 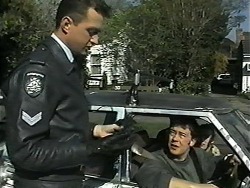 Matt explains but the police officer wants to see him licence. Helen is telling Helen how busy it has been but that it's calming down a bit now. Harold tells Helen that Madge has been nagging at him to hire a part time assistant; he is interviewing in an hour. Helen mentions that Toby benefited from counselling sessions after Kerry's death and suggests he might give them a go. Harold tells her that he is coping fine. Harold changes his mind and wonders if it might help. Helen tells him just to drop in and see. Josh is at one of the tables when Cody walks in. Cody tells Josh that she is sitting outside with Melissa but Josh insists he has nothing to say to Melissa. Cody explains to Josh that she believes Melissa is telling the truth, but he can't understand why she isn't herself. Toby is cleaning car windows with Bouncer looking on. 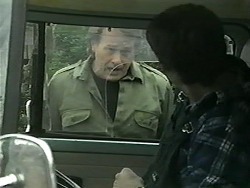 Doug is in his van and asks Toby what he is up too. Toby tells him it's his lunch break and he isn't waging school. Doug asks him if anyone knows he is doing it and he says he got the idea of Harold! Doug tells him to be careful. Melissa is doing schoolwork when Matt comes over. Melissa tells him that she has been having trouble with her eyes and she has been finding it hard to focus; she thinks they just need a good rest. Matt suggests that she gets an eye test and she agrees. Doug is telling Joe about Toby working at the busy intersection; Joe knows nothing about it and gets in his van to go get him. Melissa is testing her eyesight with a pencil. Harold is telling Madge about the counselling which she thinks is a good idea. Madge leaves to go to see Gemma at the school, Harold tells her not to upset her. Josh walks in and tells Melissa that he believes her but tells her that she has been acting weird lately. Melissa tells him she thinks it's her eyes but he doesn't seem convinced. Joe finds Toby and tells him what he is doing is dangerous. Joe tells him if he wanted the fishing reel this much he would have just given him the money. Toby thought they needed all the money so they can pay the lawyers so they can keep Sky. Toby tells Joe that instead of buying the reel he was going to give Joe the money to help pay for the lawyers. Madge is relieved to see Gemma but makes a dash for it before she sees her. Gemma spots her. Madge tells her that she was worried she had missed the exam. Gemma tells her she was a few minutes late but answered all the questions. Madge tells Gemma she doesn't want to argue and just wants them to be friends; Gemma wants the same.